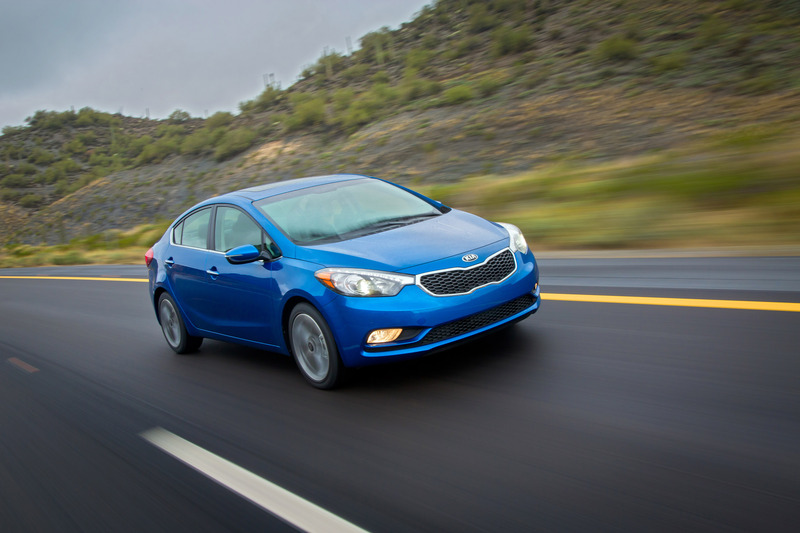 Following a successful debut at the 2012 Los Angeles International Auto Show, Kia Motors America's (KMA) all-new 2014 Forte is poised to take the compact car segment by storm. 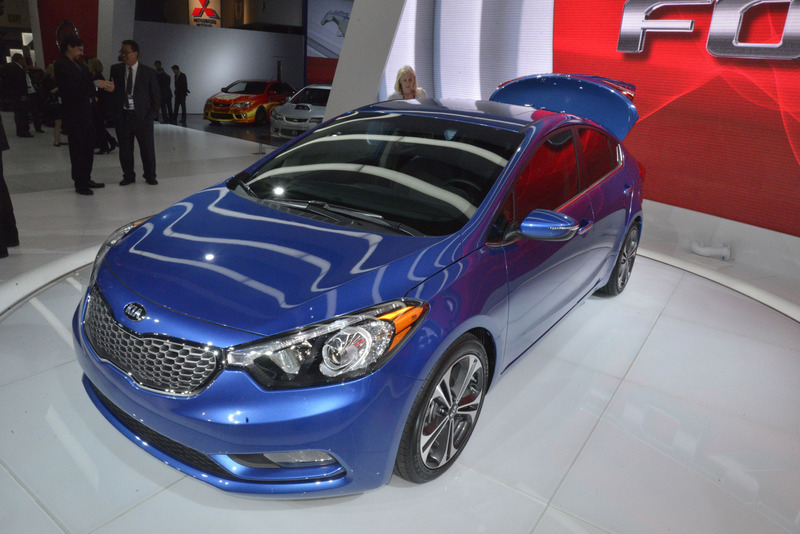 Sitting on an all-new chassis that is longer, wider and lower than the previous-generation Forte, the all-new Forte will offer more room, more performance and more premium amenities when it goes on sale in the first quarter of 2013. The all-new 2014 Forte will be offered in LX and EX variants with a choice of an efficient 1.8-liter engine or a more powerful 2.0-liter engine. 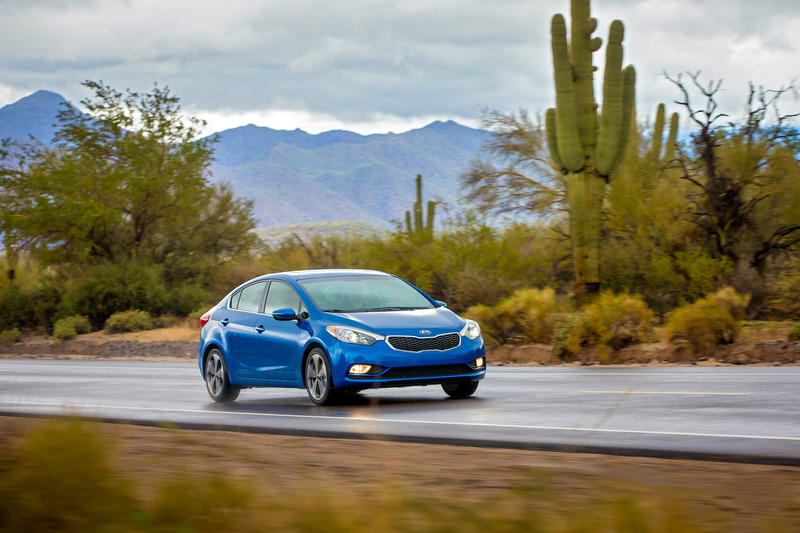 "The all-new Forte effectively raises the bar on the compact segment with its upmarket features and striking design," said Michael Sprague, executive vice president of marketing & communications, KMA. "And with its long-standing value story and reputation for quality, the Forte is now more of a complete package than ever and a fiercer contender within its competitive set." 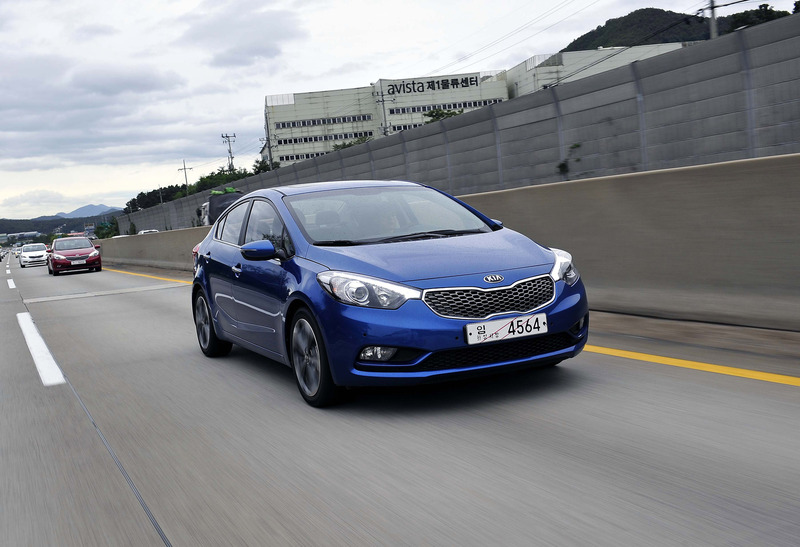 Set to arrive at Kia retailers in early 2013, the all-new Forte will represent the heart of KMA's small-car line-up, replacing the current Forte, which has been a sales success story since launching in 2009. 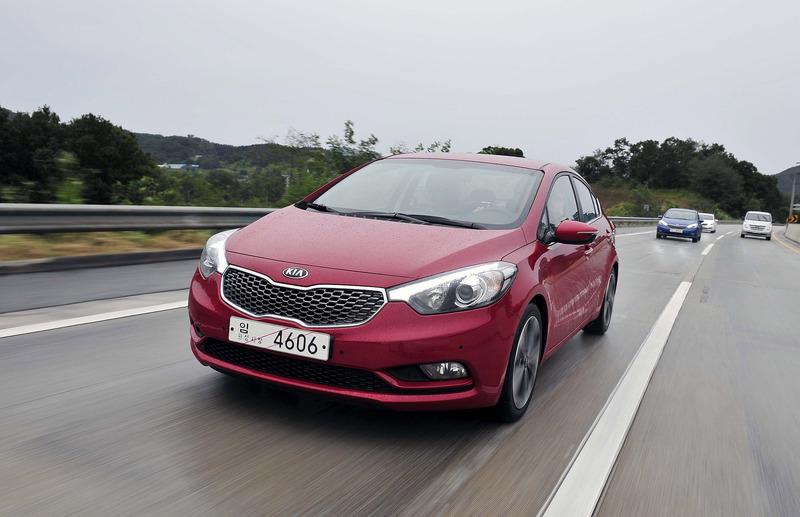 Slotted between the Rio sub-compact sedan and the best-selling Optima mid-size sedan, the all-new Forte includes a raft of unexpected available premium features in a package that easily accommodates five passengers and their belongings. 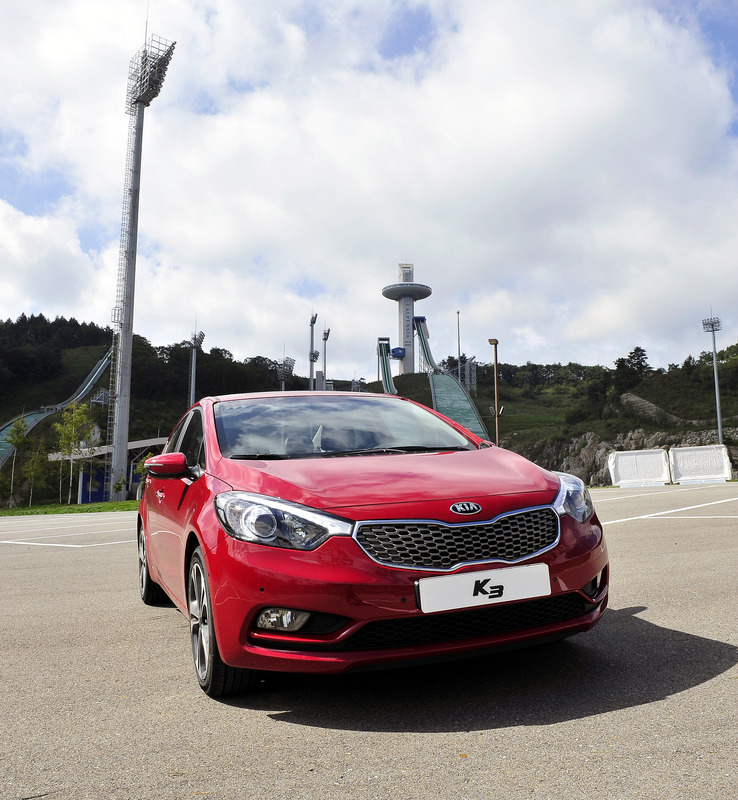 Offered in LX and EX trim levels, the all-new Forte proudly carries on Kia's reputation for offering premium features that redefine automotive segments. 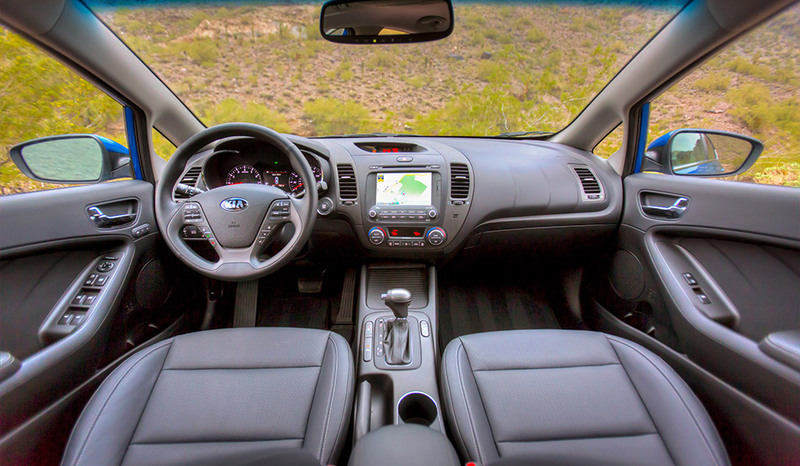 The LX model comes standard with steering wheel-mounted audio controls, SiriusXM™ Satellite Radio1, Bluetooth® wireless technology2, power windows, air conditioning and power heated outside mirrors among the many features that make the Forte stand out from its competition. The optional Popular Package adds 16-inch alloy wheels, cruise control, keyless entry with remote trunk release and a sliding front armrest. Stepping up to the EX trim broadens Forte's appeal with additional comfort and convenience features. Kia's next-generation Google-powered UVO in-vehicle infotainment system with eServices is standard and can now be integrated with an optional navigation system. Additional standard EX features include remote keyless entry with trunk opener, rear camera back-up display3, a sliding center armrest and a cooling glove box. The new optional FlexSteer™ system allows the driver to choose between three distinct steering profiles: Comfort, Normal and Sport. Features found in the optional Premium Package include heated front and rear seats, a 10-way power adjustable driver's seat with class-exclusive air-cooled ventilation, leather seat trim, power sunroof, 17-inch alloy wheels and push button start with Smart Key and a heated steering wheel. Opting for the Technology Package adds HID headlights, LED tail lights, a 4.2-inch color LCD cluster screen and dual-zone automatic temperature control with rear seat ventilation. 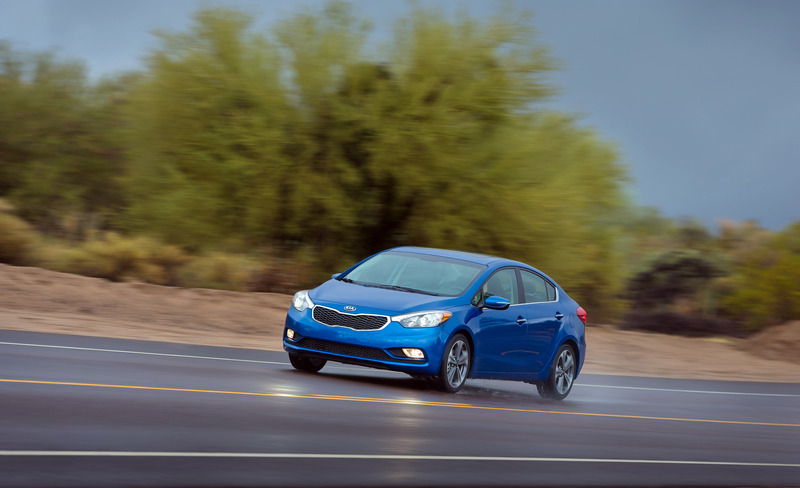 The all-new Forte offers spirited performance thanks to two advanced four-cylinder engines. The LX features a 1.8-liter powerplant, while the EX comes standard with a 2.0-liter engine. Both engines feature dual continuously variable valve timing and a lightweight intake manifold that reduces weight by 30 percent over a cast unit. The aluminum "bed plate" located below the cylinder block reduces engine NVH levels and improves block rigidity by 30 percent. With 148 horsepower available at 6,500 rpm and 131 lb.-ft. of torque on tap at 4,700 rpm, the 1.8-liter MPI inline four-cylinder engine found in the LX routes power to the front wheels through either a standard six speed manual transmission or an optional six speed automatic gearbox. Forte EX enhances the driving experience with a 173-horsepower (at 6,500 rpm) 2.0-liter inline four cylinder GDI engine. With a robust 154 lb.-ft. of torque available at 4,700 rpm, the EX comes standard with a six speed automatic. 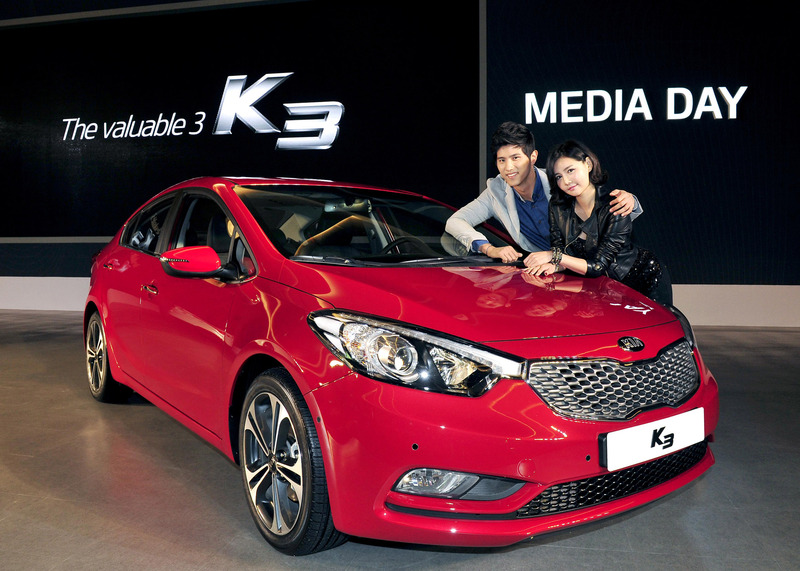 The all-new Forte boasts a chassis that is longer (by 1.2 inches), lower (0.6 inches) and wider (0.2 inches) than the previous Forte sedan. 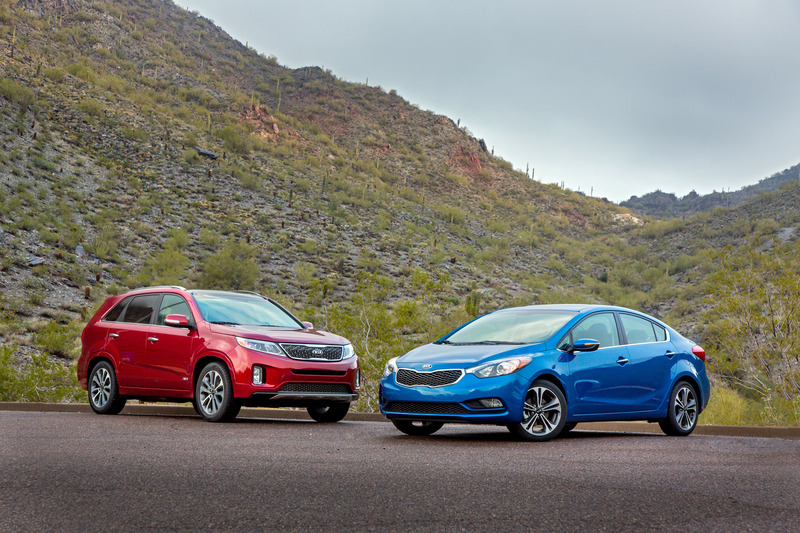 With its 106.3-inch wheelbase, two inches longer than the outgoing model, the all-new Forte rides on a McPherson strut front suspension and a coupled torsion beam rear axle. On-center steering feel is improved utilizing larger bushings and revised front suspension geometry. 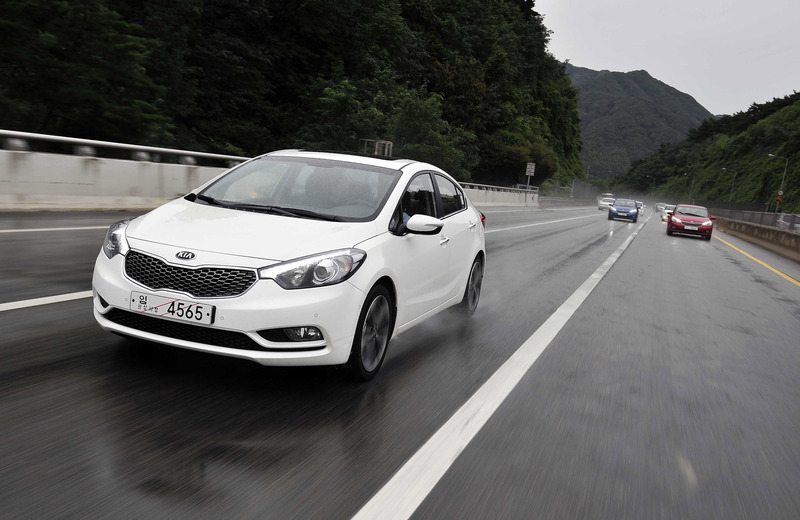 Electric power steering has replaced the hydraulic system from the previous Forte, reducing parasitic load. Optional FlexSteer puts the driver firmly in control with settings for Comfort, Normal and Sport, which vary steering effort at the touch of a steering wheel-mounted button. The base LX manual rides on 195/65R-15 tires, while 205/55R-16 tires on 16-inch alloy wheels are optional. The top-of-the-line EX is shod with the same 55-series tires. Low-profile 215/45-17 tires mounted on sporty 17-inch alloy wheels are optional. 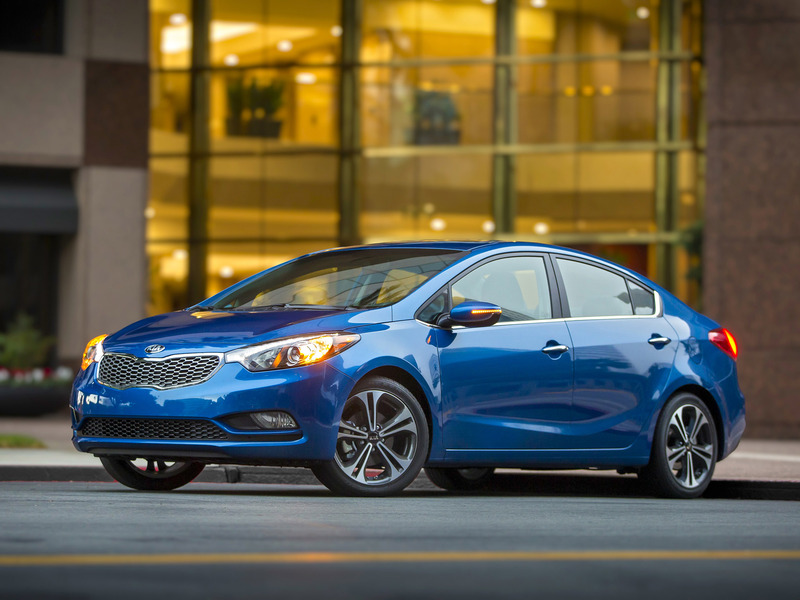 With an aggressive stance, broad shoulders and a windshield rake that can only be described as sporty, the all-new Forte looks as good parked as it does at speed. 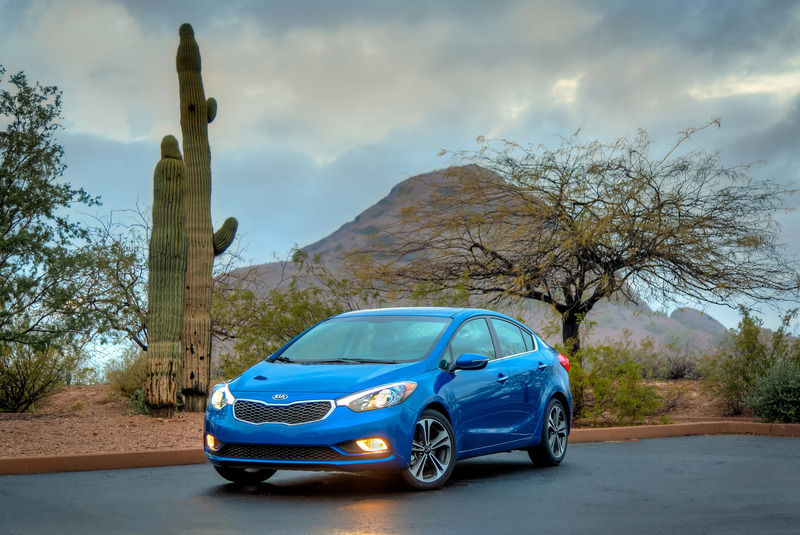 Influenced by European sport sedan styling, the Forte's modern aesthetics were born in California at Kia's American Design Center in Irvine. Dramatically swept headlight lenses cut deeply into the front fenders and incorporate projector headlamps. LED positioning lights create distinct eyebrows, making the Forte instantly recognizable in a crowd. Gentle sculpting along the Forte's lower flanks taper the sheet metal inward, affording the car a taut, nimble appearance without diminishing its road presence. Around back, the up-kicked fender line and trunk design, with its deep horizontal crease, lend width and charisma while allowing the complex curves of the tail lights to flow over the car's haunches. Opening the wide doors reveals a cabin sculpted in organic curves. Gentle character lines evoke ripples radiating from a pebble dropped into a pond. The driver-centric cabin is canted 10 degrees and features high-quality materials and soft touch points. Large, easy-to-read instruments dominate the binnacle, and secondary controls fall easily to hand. The optional 4.2-inch color LCD screen nestled between the white-on-black gauges in the EX provides trip and ancillary vehicle information front and center to the driver. Tasteful chrome bezels ring the HVAC rotary knobs and the optional push-button start. Additional chrome accents, standard Bluetooth® hands free phone integration and power windows, mirrors and door locks enhance the all-new Forte's premium feel. 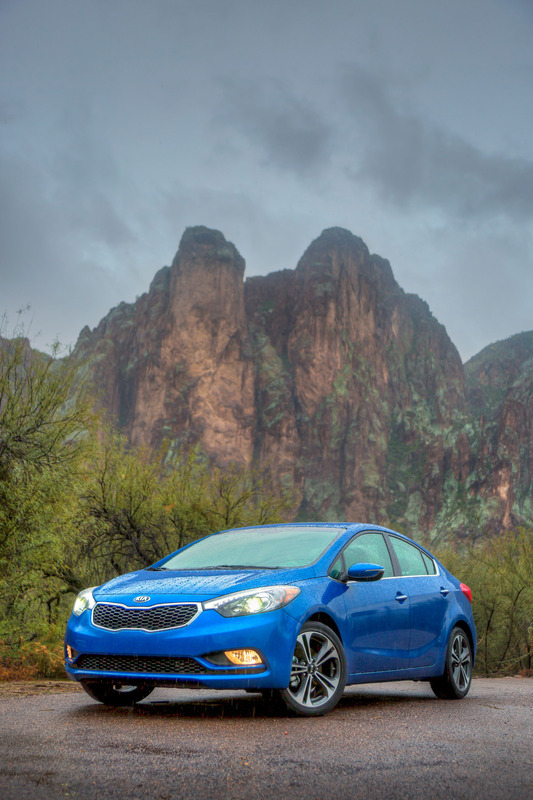 Optional leather seating trim, power sunroof, and dual-zone automatic climate control with rear seat vents and HID head lights take the Forte to new levels of sophistication.